I’m researching my husband’s Irish ancestors as part of the Irish Research 201 class I’m taking from Sharon Carmack at Family Tree University. This is a summary of his Baxter ancestors. Baxter is a Scottish/Northern English surname meaning “baker.” This family probably descended from ancestors that came from Scotland to Ireland as part of the Plantation of Ulster in the 1600’s. Henry Baxter was born about 1850 in County Antrim, Ireland. He married Elizabeth Cleeland in Belfast in 1871. They had three known children—James, Robert, and Isaac—born in Belfast and Larne, County Antrim, in the 1870’s. The family was Presbyterian. Henry's occupation was master plumber. Elizabeth Cleeland Baxter died before 1907, at which time Henry married Mary Reid. Henry and Mary did not have children and lived in Bangor, County Down. Henry died October 7, 1930 in Bangor. Henry’s middle son, Robert Cleeland Baxter, was born September 18, 1874. He married Annie Carmichael Flack on August 29, 1896 in Belfast. They had five children: Henry (who died in infancy), another Henry (called “Harry”), Isaac (also died young), Agnes (called “Nan”), and Margaret. After serving with the British Merchant Marines, Robert immigrated to America in 1908, ultimately settling in Cleveland, Ohio. He found work first as an engineer, and later as a guard at the Cleveland Art Museum. He was naturalized in Cleveland in 1924. Annie did not come to America until 1921, when she arrived in New York with Nan and Margaret on the Carmania. She and Robert had spent 13 years living on different continents. Annie Flack Baxter died in Cleveland, Ohio, on February 14, 1945, at 68 years old. Robert lived to be 81, passing away in Cleveland on October 22, 1955. Robert’s second son, Harry Baxter, was born in Belfast on August 26, 1900. In his father’s absence, he grew up under his grandfather Henry’s strict tutelage. Although underage, he voluntarily served four years with the Merchant Marines in the Great War. In 1920, he immigrated to America on the Baltic and made his way to his father in Cleveland. Harry Baxter married Leatha Evans on May 27, 1925 in Cleveland. 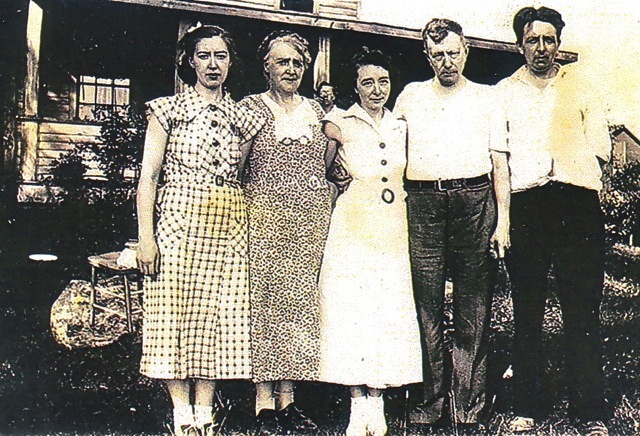 He started a plumbing business, which faltered during the Great Depression. He later operated Baxter Fuel & Supply Company, supplying coal to homes and businesses in Garrettsville, Ohio. Harry died after a brief illness at the age of 50 on September 19, 1950, leaving his wife and daughter. Leatha remarried and lived to be 92 years old. Who were the parents of Henry Baxter? When and in what town was Henry Baxter born? Who were the parents of Elizabeth Cleeland? When and where was Elizabeth Cleeland born? When (in Belfast) did Elizabeth Cleeland Baxter die? Note: while sources are not provided here due to length, I have a fully sourced version of this that I'd be glad to send you. Just email me and ask. And if you have Baxter ancestors or are researching families in County Antrim, I'd love to hear from you! I like the way you set the surname saturday post up. Going generation 1, 2 and so on. These posts intimidate me so much, that I have done 2 of them. And, #2 was an update to #1. Which just shows you how intimidated I really am. I'm relieved to know I'm not the only one who's wrestled with how to set up a Surname Saturday post, Terri. Glad that this format makes sense to you. Don't be intimidated--just pick a name for which you only have a few generations and copy this format if you like!